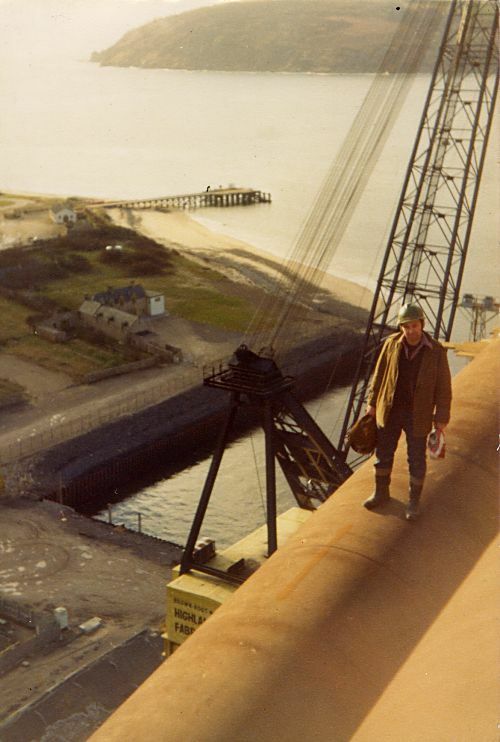 Andy Young standing on top of the pile sleeves of the Southern Ninian platform at Nigg. (Note the lack of handrails). My dad says he's nearly 300ft up there and scaffolding or handrails weren't a requirement back then. He and several others were working inside that pipe he is walking on one day when a crane hit another pipe against that one and all of them had to get out of a man hole hatch and run down that pipe. After seeing this pic I no longer think my mam (picture #645) is the only mad person in my family. Oh yes - handrails - puulllease ! ... we used to wander around on the top of the upper legs and cross-braces, with our hands in our pockets! I worked as a production operator on the Ninian Field for 26 years. I worked on Ninian Central, which was built at Kishorn and Ninian Northern and Southern which were built at Nigg. Ninian South was my last one. I remember Derek when you arrived at Cullicudden you Jim Mclean and Peter ? three poor students.